Do you vary your strength training but crawl through the same cardio routine? That doesn't make sense! Here's how fitness model Jen Jewell keeps the elliptical blues at bay. You might be surprised to know that fitness models face the same problems as the rest of us when it comes to cardio: boring routines, progress plateaus, and lack of time. Pro fitness model, Cellucor athlete, and online coach Jen Jewell was once a creature of habit, but she says everything changed when she started getting as creative with her cardio as she was with her strength training. "For years, I was stuck in a rut and would do the elliptical each and every day simply because I liked it and it was easy for me," she explains. "It was only when I started trying different forms of cardio—including some that were frankly a struggle for me—that I started to feel challenged again. That led to greater calorie burning and huge improvements in my endurance." Today, Jewell says she'll use a different cardio approach or different machine every training day. If you can't remember the last time you tried a new cardio routine, now is definitely the time to try something different. Here are four of her go-to routines. 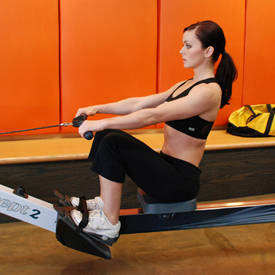 Jewell admits that the rowing machine isn't her favorite mode of cardio. But rather than use this as an excuse not to do it, she looks for ways to make it more exciting. 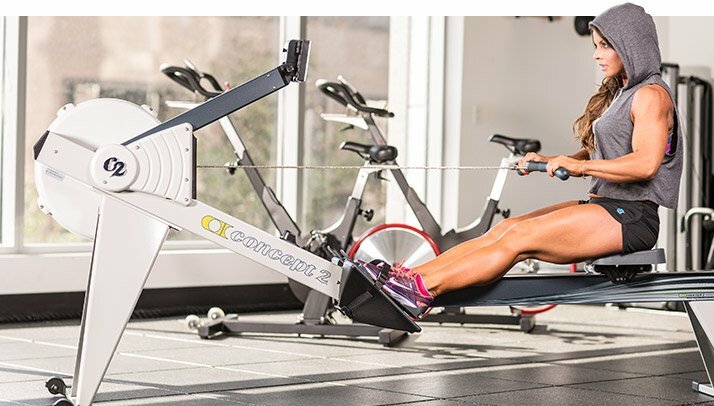 "When I head to the gym to do the rowing machine, I keep it interesting by setting little mini goals for myself, doing brief intervals of resistance training combined with the cardio," she explains. This workout should take a total of 20-25 minutes. 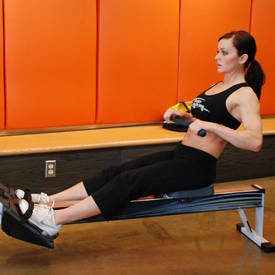 You'll perform three rowing intervals, then hop off the rower and perform a quick circuit of resistance moves. Then it's back to the rower to repeat the process. Warm-up 3-5 min., 20-25 strokes/min. "Bike workouts get a bad rap," says Jewell. "But there's a good reason why. Usually I see people just pedaling aimlessly, often reading a newspaper, watching movies, or just sitting there zoned out without putting in much real effort." "I love using the spin bike to increase the intensity by getting out of the saddle and performing some climbs or sprints while still staying on the bike," [Jewell] says. The answer, she says, is to approach a bike workout with all the intensity and variety you would experience if you were cycling through a real landscape. "I love using the spin bike to increase the intensity by getting out of the saddle and performing some climbs or sprints while still staying on the bike," she says. Wondering if you're making it intense enough? Jewell suggests taking the "talk test" to decide. "If you can have a normal conversation while you're in the middle of high-intensity cardio, you aren't doing it right," she explains. "You should not be able to chat with your bestie while you're sprinting. If you can, you are not in full sprint mode." "Hands down, my favorite way to work up a sweat on cardio equipment is the StepMill," says Jewell. "This machine really challenges my endurance and always has me working up a serious sweat in a matter of minutes." Whenever she's pressed for time or is simply looking for a way to kick her cardio up a notch, Jewell turns to the StepMill for serious results. The following workout should take you 45 minutes to complete. If the levels are too challenging for you, lower them appropriately, but remember to push yourself to your limit here. If you aren't on a machine with levels, simply vary your stepping rate instead. Jewell finds the best cardio workouts are often the ones that have you off the machines as much as you are on them. "Instead of spending a ton of time stepping or pedaling away, this workout has you mixing things up throughout the entire workout. It definitely helps pass the time pass quickly." Jewell finds the best cardio workouts are often the ones that have you off the machines as much as you are on them. For this workout, you'll need a medicine ball along with one piece of cardio equipment. 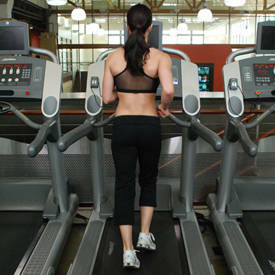 If you're using the treadmill, try using it on an incline rather than on fast speeds as that'll help work the glutes more. High-intensity machine cardio: 1 min. 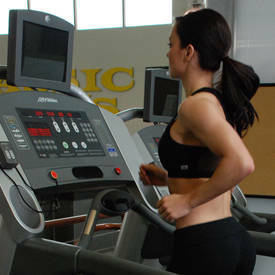 Moderate-intensity machine cardio: 1 min. Moderate-intensity machine cardio: 2 min. Maximum-intensity machine cardio: 20 sec.